The evolution of gastrointestinal pathology coincident with development of endoscopy and mucosal biopsies has revolutionized management of patients with gastrointestinal disorders. Virtually every part of the tubular gut is now amenable to visualization and sampling. High-resolution cross-sectional imaging routinely detects asymptomatic tumors in patients under surveillance for chronic liver disease. This intensely focused course, presented by a spectacular faculty, will help pathologists generate comprehensive and accurate differential diagnoses for a variety of inflammatory and neoplastic disorders based on limited biopsy material. The United States and Canadian Academy of Pathology designates this enduring material for a maximum of 15.75 AMA PRA Category 1 CreditsTM. Physicians should claim only the credit commensurate with the extent of their participation in the activity. The USCAP is approved by the American Board of Pathology (ABP) to offer Self-Assessment credits (SAMs) for the purpose of meeting the ABP requirements for Continuous Certification (CC). Registrants must take and pass the post-test in order to claim SAMs credit. Physicians can earn a maximum of 15.25 SAM credit hours. 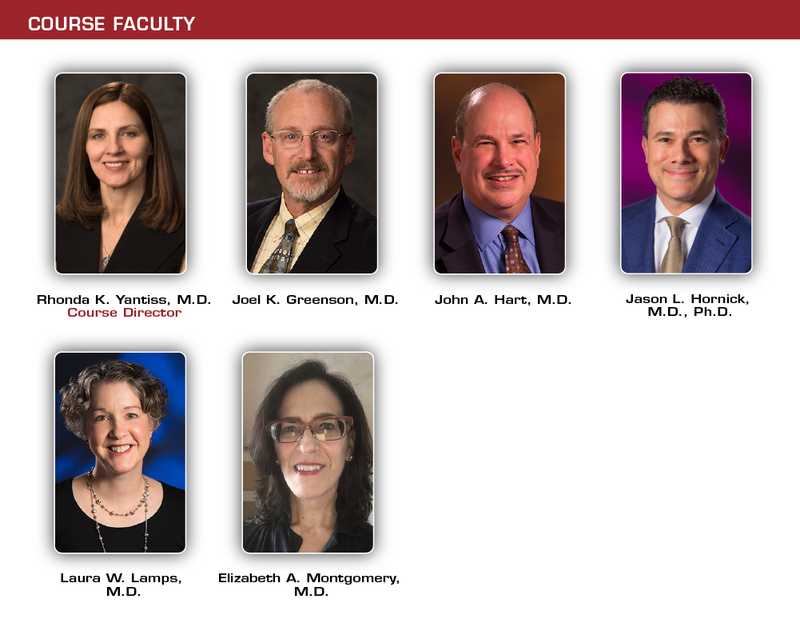 The following faculty reported no relevant financial relationships:  Rhonda K. Yantiss, M.D., Joel K. Greenson, M.D., John A. Hart, M.D., Jason L. Hornick, M.D., Ph.D., Laura W. Lamps, M.D., Elizabeth A. Montgomery, M.D. Buy the entire High Intensity Interval Training in GI Pathology: Not for the Faint of Heart course and get a great discount! Not A Member? Click Here .